Just a quick suggestion really in regards to the visuals of the sliders/trends. First (slider) ; when using ticks to identify points along the slider you cannot change the colour of the ticks, in my eyes the ticks should change with the label colour as you can see from my image the ticks basically become useless/unreadable. Just a quick and easy suggestion really. Secondly (trends); one of the only disappointing features for me has to be that the customisation of the trend display is so very limited, as you can see from my screenshot it's just a big white block and does not really fit in well with the rest of my program. Being able to edit/add/remove elements such as buttons, their colours and the trend background would be great, also why is there no zoom ability or option to hide different trend lines? Hi--sorry I missed this when you posted! I think that a zoom option is available in the multi-touch panels. The option to change the curves visibility exists (I don't remember if it was added in UniLogic 1.25, or it is one of the features of the upcoming 1.26). The slider feature was not yet implemented. At the initial time of posting I wasn't aware that the multi-touch panel had the functionality already. I am running v 1.25 of Unilogic and can confirm it hasn't been added as of yet. I noticed you did not mention the visual adjustments to the trend graphics interface, could you confirm if this is to be implemented in v1.26? the ability to adjust the colours of the axis, titles, background end disable / implement our own buttons for default buttons as the current visuals really don't match our standard layouts and its a bit of an eye sore on our screens, we really need the ability to be able to fit the trace into our own theme. Any updates on this? The only change that was made to the Trend UI in 1.26 is selecting if the date would appear in all the intervals in the X-Axis (until now, it appeared only on the left side, but you sample data near midnight, then there would be several dates on the same axis). I'll raise the Trend visualization adjustment request again, jut one question. 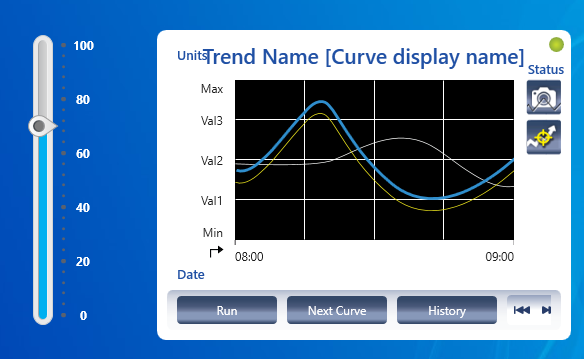 If you want to hide buttons, then how would you change the selected curve, pause or run the trend, take a screenshot etc? Well, actually, Data Sampler has a struct. Trends are just a view of the sampled data, and there can be different views to the same sampler (both in HMI and Web). I'll raise that issue again. One option might be functions in the trend itself that could be called from an action of an external button, but that's a feature that does not exist yet, so I must discuss it first with the Panel team and see if it's even possible.